Cutting teeth into the proper prep for the prescribed dental restoration is a routine task for many dentists, and having the proper dental preparation burs on hand is important. Different restorations require preps with different characteristics. To accomplish this there are numerous preparation bur styles, as well as different materials used to make these burs. 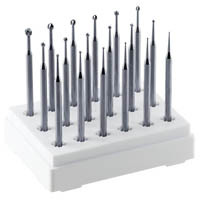 These varieties include preparation carbide burs and carbide bur systems, preparation diamond burs, and titanium preparation burs. While the choice of bur material and bur style can be a personal preference, it is important to prepare the tooth with the proper margins and clearance to accommodate the prescribed restorative solution.